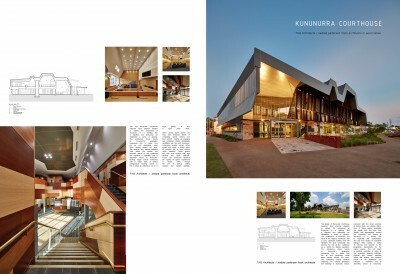 The new Kununurra Courthouse interprets local physical qualities to capture the uniqueness of Kununurra in a building that is dignified and welcoming yet establishes a sense of gravitas. The architecture re-introduces the value of the regional courthouse with a civic, landmark building that will represent the local community and promote the role of the courthouse as a centre for dispute resolution. The architecture draws heavily on Kununurra’s geographic uniqueness that is visible from the air and particularly visual when moving around the town. The contrast of the natural landform embracing the ordered plantations and buildings is especially unique, combined with the close proximity of Kelly’s Knob and Hidden Valley. Both of these natural landmarks are visible from the site; they visually and experientially connect the community and visitors to Kununurra in a manner that is respectful and sophisticated. The roof form of the building creates an immediate dialogue while creating a variety of volumes that respond to the programme requirements for the interior spaces. The height of the roof is also carefully controlled to relate to the immediate adjacent buildings. External and internal materials used, reflect the layered and fractured nature of the landscape and introduce a materiality that is absolutely unique to Kununurra. Sunshade devices control the heat load on the building while modifying the experience of the interior space. On the north-western facade the roof form folds down with large panels perforated with an image of Lake Kununurra. This provides a sunscreen that limits the direct sun and creates privacy to the judicial chambers and mediation suite. On the south-eastern façade a large brise-soleil follows the form of the roof protecting the glass while changing the scale of the interior, creating spaces that are intimate or communal. Building edges include continuous built in timber seats of various configurations enabling visitors to find a place of preference, to sit in large groups or find a quiet place alone. The brise-soleil dialogues with the seating and visitors, framing views to distant hills and local landscaping. A secure external waiting space extends from the main foyer and continues the undulating built-in seating in a local stone, enabling visitors to enjoy a shaded outdoor space with filtered views to the sky. The programme called for a facility that was both welcoming and calming for all court users, particularly local indigenous people. Stone paved public foyers are lined with horizontal bands of natural timbers and local artwork, creating an engaging and contextual interior immediately identifiable with the local community. Courtrooms on the other hand, also employ natural timber linings but create a formal sense of occasion with a more uniform colour selection. Courtrooms are always connected to natural light, provided with controlled outlooks into private courtyards, and distant views of the sky and or trees. These spaces are calm and focused with high volumes and warm materials. Foyers and courtrooms reference the quality of space experienced in Hidden Valley through the use of carefully crafted material and spatial qualities.